Antigo Silt Loam was declared the official state Soil on September 14, 1983. It is called Antigo silt-loam and was selected in 1983 to help remind us of our responsibility to take care of our soil resources. People argued that soil, a natural resource that took 10,000 years to produce, not only is essential to Wisconsin's economy, but also is the foundation of life itself. Silt loam is a productive, silty soil originating from the glaciers and enriched by organic matter from prehistoric forests. This soil is found mostly in Wisconsin, stretching in patches across the north central part of the state. It is named after the city of Antigo. This soil supports dairying, potato growing, and timber. 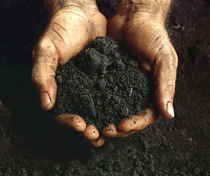 This soil occurs only in Wisconsin, across the north central part of the state. It is a versatile and productive soil and is representative of the many silty soils that cover nearly half of the state. It is named after the city of Antigo in Langlade County. Professor Francis D. Hole, a UW-Madison soil scientist was behind the drive to declare an official state soil. It was done to remind the people of Wisconsin of their soil stewardship responsibilities. Antigo Silt Loam was selected to represent more than 500 major soil types in Wisconsin. People argued that soil, a natural resource that took 10,000 years to produce, not only is essential to Wisconsin's economy, but also is the foundation of life itself. Silt loam is a productive, silty soil originating from the glaciers and enriched by organic matter from prehistoric forests. This soil is found mostly in Wisconsin, stretching in patches across the north central part of the state. It is named after the city of Antigo. This soil supports dairying, potato growing, and timber. About 11,000 years ago, near the end of the last Ice Age, glacial melt waters deposited the sand and gravel outwash that forms the lower subsoil and substratum of the Antigo soil. Strong winds and glacial melt waters then deposited 2 to 3 feet of silty loess and loamy outwash on top of the sand and gravel. Soil development, under northern hardwood forests, produced an organic enriched surface layer and a clay enriched subsoil. The soil stores water for use by plants and filters our ground water and surface water. We depend on the soil to provide us with food and fiber. Soils play a major role in recycling carbon and nitrogen. Without soils neither we or the ecosystems in which we live could exist. The quality of our soil resources directly affects our quality of life. Good conservation practices allow us to use the soil while protecting the environment and keeping the soil healthy for future generations. The Antigo series consists of very deep well, drained soils which are moderately deep to sandy outwash. 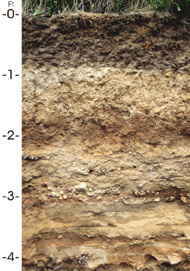 These soils formed mostly in loess or silty alluvium and in loamy alluvium underlain by stratified sandy outwash. Typically these soils are on outwash plains, stream terraces, outwash terraces, kames, eskers, glacial lake plains, glacial drainage ways, and outwash areas of moraines. Permeability is moderate in the silty and loamy layers and rapid or very rapid in the sandy outwash. Slopes range from 0 to 30 percent. Mean annual precipitation is about 30 inches. Mean annual air temperature is about 42 degrees F.
1.10 State song, state ballad, state waltz, state dance, and state symbols. (p) Antigo silt loam (typic glossoboralf) is the state soil.